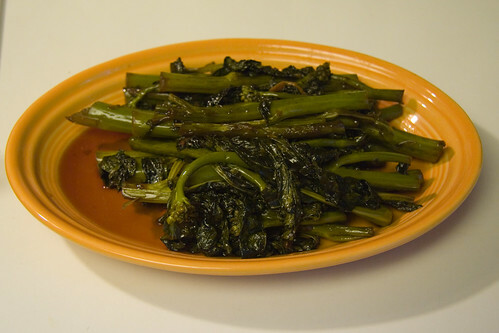 I decided to kick off the second quarter of Fifty Two Foods by venturing into uncharted territory—a vegetable I had not only never cooked, but that I had never heard of or seen before: Gailan. 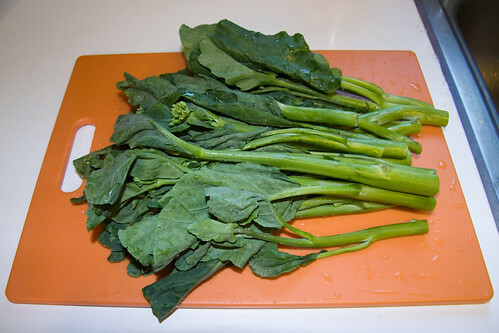 I discovered this robust looking vegetable at the Vue Family Farm stand at the Davis Farmers’ Market, and figured I could prepare it like Chinese broccoli (which it resembled) one of my favored Dim Sum dishes. 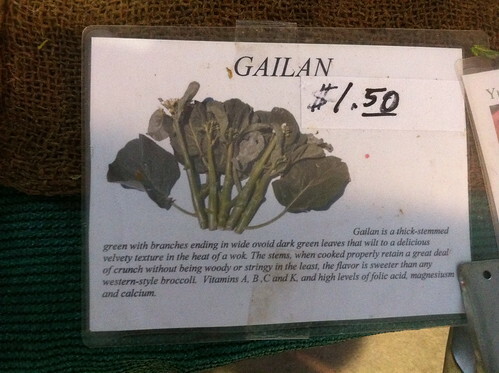 It turns out that, far from some newly discovered green, gailan is Chinese broccoli. So while this was perhaps a touch less revelatory than planned, it was clear to me how I would cook it. 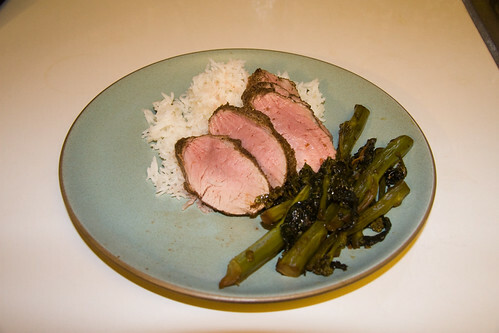 I decided to prepare the gailan alongside a 5-Spice pork tenderloin. Whole Foods came through with a handy recipe for the pork, but I was confident I could cut my own path on the rest of the meal. 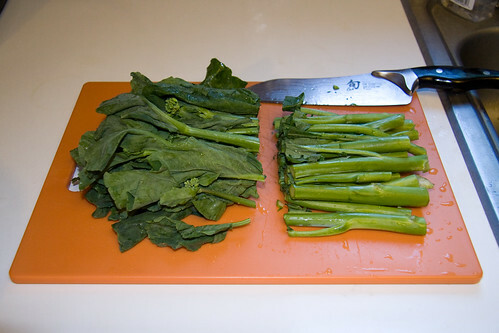 First I chopped the gailan in half to separate the thicker base of the stalk from the leafy tops. Next, I sliced one clove of garlic, one shallot bulb and the whites of two green onions. 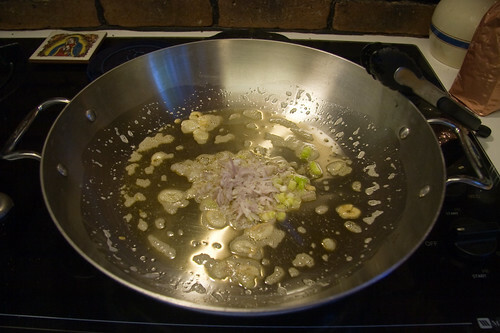 I added these to a pan of toasted sesame oil, first the garlic and then the onions once the garlic had softened. 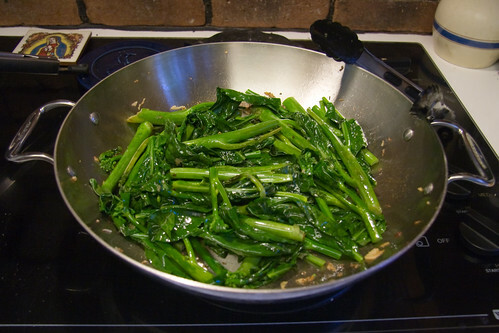 When the garlic and onions were fragrant, I added the thick stalks of gailan and sautÃ©ed them for 5-7 minutes, until their skin began to blister. 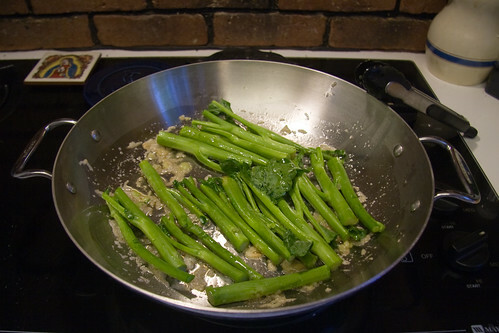 I added the tops of the gailan and tossed them with the stalks, then added soy sauce and lowered the heat. The gailan cooked covered for 20 minutes, while we made the pork. After removing them from the pan, I put a little teriyaki sauce over the greens. If we had hoisin sauce, I’d have used that instead, but the teriyaki worked just fine to balance the saltiness of the soy sauce. We served the gailan and pork with some steamed rice for an easy, Chinese style dinner.